A-HOTEL.com - Mejillones B&B, pensjonaty. Pokoje gościnne zakwaterowanie ze śniadaniem w Mejillones. Mejillones B&B, pensjonaty w różnych cenowych i pojemności mniejszej dodatkowe udogodnienia niż hotele. Na innych domów ręcznie gości (emerytury i renty) w Mejillones zwykle oferuje więcej przytulne i rodzinna atmosfera, a także poranne śniadanie. Casa Blanca Hospedaje is set in Mejillones. The bed and breakfast is equipped with a cable flat-screen TV. Featuring free WiFi, Hospedaje SAN FRANCISCO is set in Antofagasta. The property is located 14 km from Regional Calvo y Bascuñán Stadium. Located 11 km from Regional Calvo y Bascuñán Stadium, House Amanecer in Antofagasta features a shared lounge. Both private parking and free WiFi are available at this property. Featuring free WiFi throughout the property, Hostal Cruz del Pacifico offers accommodation in Antofagasta. Free private parking is available on site and daily free breakfast is served. Set in Antofagasta, in a building dating from 2018, 8 km from Regional Calvo y Bascuñán Stadium, Hostal Refugios offers guestrooms with free WiFi. Boasting a 24-hour front desk, this property also provides guests with a restaurant. Featuring free WiFi access and located only 800 metres from Cavada bus station, Hostal El Olivar offers accommodations in Antofagasta. A complimentary Continental breakfast is served daily. Situated in Antofagasta, 4.2 km from Regional Calvo y Bascuñán Stadium, Hostal Calle Lima offers a shared lounge and rooms with free WiFi access. Set in Antofagasta, in a building dating from 2011, Hostal Verona features a garden and guestrooms with free WiFi. All rooms boast a flat-screen TV with cable channels and a shared bathroom. Set in Antofagasta, 2.2 km from Regional Calvo y Bascuñán Stadium, Desierto de Atacama provides accommodation with a terrace. Di Giorgio Residencial is situated in Antofagasta, only 800 metres from the city centre. Private parking is available on site. Boasting a garden, terrace and free WiFi, Cardones del Desierto is located in Antofagasta, 2.3 km from Regional Calvo y Bascuñán Stadium. 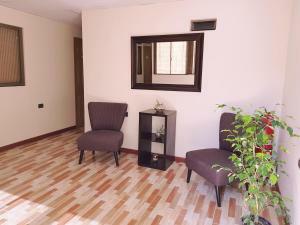 Residencial Mary is offering accommodation in Antofagasta. This property is located a short distance from attractions such as Regional Calvo y Bascuñán Stadium. Located in Antofagasta, Hostal Los Chañares features accommodation within 2.1 km of Regional Calvo y Bascuñán Stadium. Located 3 blocks from the beach and featuring free WiFi throughout the property, Hostal 1127 offers accommodation in Antofagasta, 1.2 km from Regional Calvo y Bascuñán Stadium. Located in Antofagasta, Fragga Hospedaje Boutique offers a garden. All rooms feature a flat-screen TV with cable channels and a private bathroom. Featuring free WiFi, Claris monkey is situated in Antofagasta, within 1.3 km of Regional Calvo y Bascuñán Stadium. Featuring free bike rental, Hostal Casablanca offers accommodations in Antofagasta. Free WiFi access is available. Hostal Chuquicamata offers accommodation in Antofagasta. Every room includes a flat-screen TV with cable channels. Featuring free WiFi access and a complimentary breakfast, Playa Blanca Antofagasta offers accommodations in Antofagasta. Rooms here are all fitted with a flat-screen TV with satellite channels, a shared bathroom and a garden view. Situated in Antofagasta, 4.1 km from Regional Calvo y Bascuñán Stadium, Santa Marta has rooms with free WiFi access.